How often do you go to the cinema? With the likes of Netflix or Amazon Prime Video allowing you to stream HD shows and films into your home, or just watch them on your commute, the answer may not bode well for traditional cinema chains. But when ‘going to the movies’ has been replaced by ‘Netflix and chill’, the most successful counter is cinema experiences that go above and beyond what you can get from a home television or computer screen. The IMAX name is already synonymous with blockbuster cinema, with the company having set the bar for high-resolution footage capture, and built up a sprawling network of IMAX theaters across the globe. Although the company started out doing mainly educational shorts and nature documentaries – and it’s still producing such content – it cannonballed into Hollywood with the release of Christopher Nolan’s The Dark Knight back in 2008, giving audiences a real appetite for high-resolution film. In the years since, the likes of Transformers, Interstellar, and Marvel's Infinity War have all featured footage shot on IMAX cameras, proving ideally suited to films focused on visual spectacle. What you might not know is that IMAX isn’t just a screen to sit in front of: you’ll only see the IMAX branding for a specially kitted-out cinema with dedicated projectors and speakers, and a PPS (Proportional Point Source) audio system that treats every seat as pride of place, and which can reportedly go a whole octave lower than standard cinema audio. But the current generation of moviegoers are aware that they can access countless films from a variety of different sources: on their computers, TV channels, streaming devices, Blu-Ray players, or even projectors for more serious home viewing. And with hundreds of films being released every year, it’s natural that they’ll cherry-pick the ones they think are worth watching on the big screen. We spoke to IMAX’s Chief Technology Officer, Brian Bonnick, who has overseen the company’s huge growth from just 40 or so theaters in the early noughties to over 1,300 today. Unlike some of the naysayers, Bonnick doesn’t think that home streaming is a death knell for cinema, pointing to the sheer difference in scale between a standard television and the company’s giant screens, which are typically 52 feet by 72 feet in size, not to mention the higher-end video and audio formats on offer. The challenge facing cinemas today is proving they can offer that experience, and there are plenty of ongoing attempts. One of the more eccentric ideas comes from ScreenX, which has been developing three-wall movie screens that offer a 270-degree of view, although we’re hesitant to recommend it for a moviegoing experience. Is ScreenX’s three-wall movie screen worth the ticket premium? Meanwhile 3D lingers on long after IMAX pioneered the technology, although it’s no longer the disruptive force many filmmakers thought it would be, and even the much-hyped virtual reality is starting to lose some of its allure. IMAX itself had started developing a gold-standard VR camera alongside research teams at Google, but the project has reportedly been put on hold as the latter company focused more on augmented reality (AR) technologies. Two of IMAX’s seven ‘VR experience’ sites at their flagship theaters have already been shut down, with the future of the remaining five being anyone’s guess. Although Bonnick says they’re “figuring out how to monetize” VR, it doesn’t really look like ‘add-on’ experiences are going to help save traditional cinemas from extinction. Instead, with audiences expecting ever improved visuals, on everything from their TV to their smartphone, truly awesome picture (and audio) quality may be the only gimmick people need – and right now that’s where IMAX is focusing its efforts. TechRadar got the chance to visit IMAX’s research facility in Toronto, Canada, which is one of only four sites worldwide with the company’s latest projector system installed. But the cost of continually advancing the technological capabilities of your projection system is, well, the cost. The new, more compact single-laser projector is set to vastly drop the production and installation costs involved, which are considerable for theaters wanting that upgraded experience. IMAX are tight-lipped about exact figures, but you can bet it runs up some considerable bills. The new projector is being rolled out this year, and there’s already a backlog of orders, with many existing IMAX sites requiring a refit to accommodate the technology, which is built for longevity. With fewer glass parts – which degrade every time light passes through them – the new projectors are estimated to last for 24-40,000 hours, compared with the 6-11,000 hours of the xenon projectors. 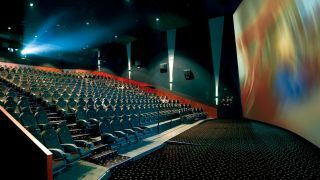 With over a thousand IMAX theaters worldwide, the company is used to working in a lot of differently sized spaces, each with their own challenges, while running a 24/7 maintenance service that tracks the degradation of old kit and knows when replacement parts, servicing, or software updates need to be sent out (“94% of IMAX’s technical issues are resolved remotely”, Bonnick claims). IMAX’s future success will be dependent on it offering simpler, cheaper technology that’s easier to implement and maintain. If IMAX can continue to lower the price barrier for existing movie theaters to upgrade, it could be just the thing for keeping theaters operational and giving enough of an improved experience to coax audiences out of their homes.